In order to provide you with a higher quality product, all of our High Flying Dice Games now come with mounted counters! 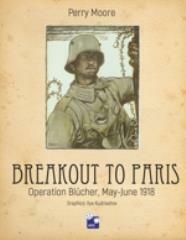 Breakout to Paris depicts the third German Aisne offensive. It followed Operation Michel in March. General Erich Ludendorff was determined to win the war, and these offensives were Germany's last attempts. Ludendorff’s earlier Operation Michel was a near catastrophe for the Allies and Operation Blücher would be just as dire and another German near miss with the German offensive ending within hours of reaching Paris. Some historians claim the two American divisions timely arrival saved Paris from calamity. The German offensive within a period of a few days had created a huge bulge and gained over 35 miles and had taken 50,000 Allied prisoners.